In four of the past five winters, the North Pole has witnessed dramatic temperatures spikes, which previously were rare. Now, in the lead up to summer, the temperature has again shot up to unusually high levels at the tip of the planet. Much of the entire Arctic north of 80 degrees latitude is abnormally warm. The temperature averaged over the whole region appears to be the warmest on record for the time of year, dating back to at least 1958. It is about 18 degrees (10 Celsius) above the normal of 4 degrees (minus 16 Celsius). As the warm air intruded the Arctic, sea ice melted suddenly. The Norway Ice Service tweeted the sea ice area near Svalbard, the small island chain between Norway and the North Pole, fell by about 32,000 square miles (82,000 square kilometers) to the second lowest area on record. The amount of ice lost is enough to cover the entire state of South Carolina. Zachary Labe, a climate scientist at University of California in Irvine, said that such a pulse of warm, moist air into the Arctic can "have a long-lasting fingerprint" that preconditions the ice to melt more rapidly in the summer. Indeed, a study published last year in the Journal of Geophysical Research found that these spring intrusions of warm, moist air can "can initiate sea ice melt that extends to a large area" through the summer and fall. Already, Arctic sea ice is near its lowest extent on record. The Bering and Chukchi seas have never had so little ice in recorded history. 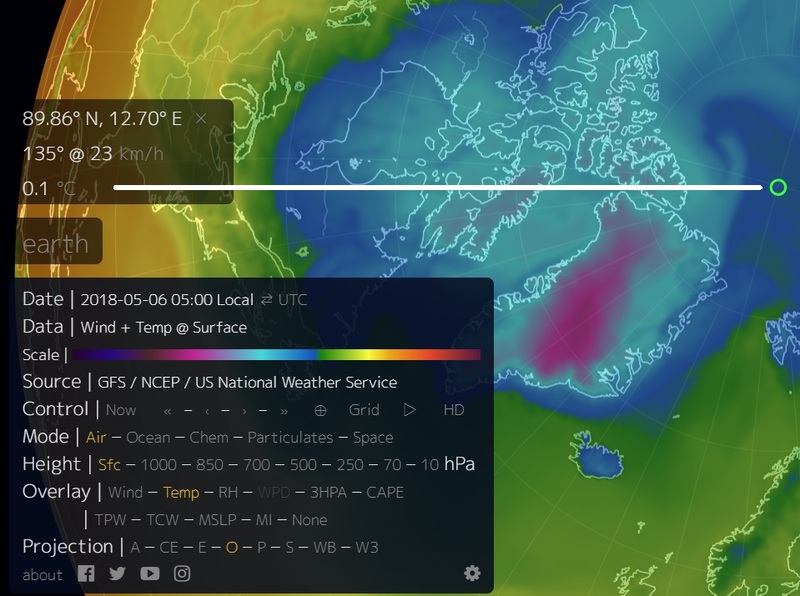 Interestingly, while much of the Arctic has turned abnormally warm, the cold air normally entrenched over the region has had to move somewhere. In recent days, it has parked over south-central Greenland where temperatures are 30 to 35 degrees colder than normal. The warming of the Arctic and loss of ice are likely strongly connected to the buildup of greenhouse gases in the atmosphere from human activities. On Friday, a NOAA study was published that found that the "extraordinary heat" that affected the Arctic in 2016 "could not have happened without the steep increases in greenhouse gas concentrations." Last week Pakistan experienced the world's hottest April day on record, with temperatures peaking at 122.4F (50.2C), according to experts. The Pakistan Meteorological Department confirmed the extreme temperature was recorded in the city of Nawabshah on Monday, April 30, potentially making it the hottest April temperature ever witnessed on Earth. Today England experienced it's warmest May day ever when the mercury hit 84F (29C) on it's May Bank Holiday with Holland to have it's hottest May day tomorrow with temperatures around 30C, 86F.